This is an INCREDIBLE VALUE pattern - 4 quilts in one pattern! 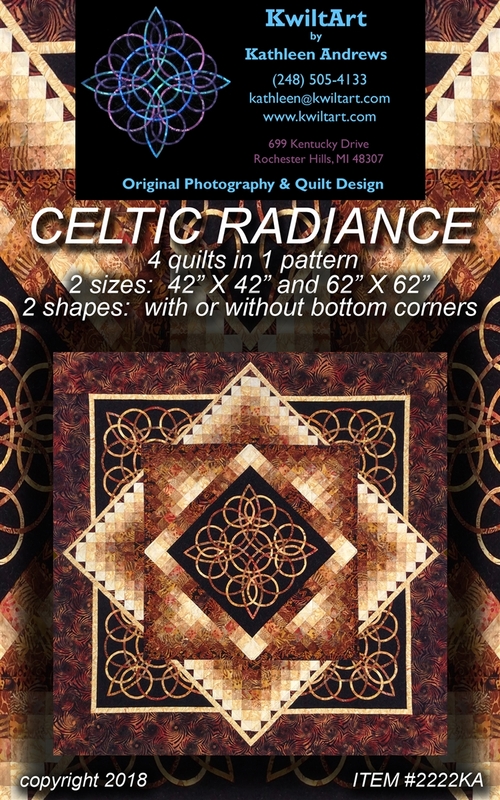 You get two size options - 42" X 42" and 62" x 62" (you get the full size Celtic templates for both sizes). You also get two different shape options - with or without bottom corners. 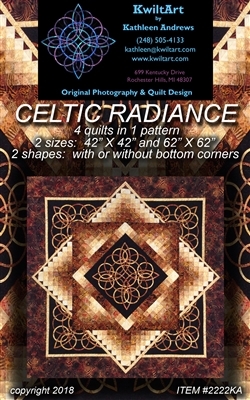 Celtic Radiance is a very easy quilt pattern using simple strip piecing techniques and double sided tape instead of pins to secure the Celtic area prior to sewing and to ensure perfect circles. KwiArt has a YouTube video called "Celtic Quilting Made Easy" for a mini workshop! This is for the confident beginner/intermediate quilter. Press here (KwiltArt Etsy Shop) to order an instant download PDF version of this pattern.